Educators depend on high quality audio in the classroom or computer lab to teach topics ranging from phonics to foreign language acquisition. These all-purpose multimedia player/recorders provide flexibility and durability for differentiated individual or small group instruction as well as for a class of up to 75 people. The flexibility of Music Maker learning centers helps you optimize instruction time. Various sized groups can be accommodated with jackbox and headphone combinations. 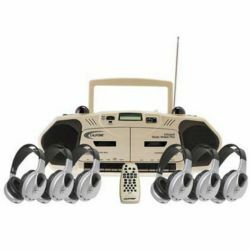 6-person Infrared Music Maker Learning Center comes with six HIR-HP1 wireless headphones, no jackbox or external transmitter necessary.